he rich liturgical life of the Coptic Church centers on three liturgies: the liturgy of St. Cyril (also known as the liturgy of St. Mark); the liturgy of St. Basil and the liturgy of St. Gregory the Theologian. Today, these liturgies are celebrated on specific occasions, for example, the liturgy of St. Cyril is celebrated during Lent and the liturgy of St. Gregory on Feastdays of Christ. While these texts are currently not in use outside of the Coptic Church, there exists both a Coptic and a Greek version for each of these liturgies. This raises interesting questions of origin concerning especially the liturgy of St. Gregory. For the liturgy of St. Gregory both Sahidic and Bohairic Coptic manuscripts exist, dating to the 6th century or so, while the oldest Greek manuscript which exists for this text, Parisinus Graecus 325 dates from the 14th century. While this would seem to suggest that the liturgy of St. Gregory was written originally in Coptic and then translated into Greek at a later time, internal evidence in the liturgy suggests otherwise. Two prayers in particular in the Greek liturgy of St. Gregory are of interest here: The prayer of the veil in the pre-anaphoral section and the alternate prayer of the bowing of the head in the post-anaphoral section. Both of these prayers are also found in the Byzantine liturgies of St. John Chrysostom and St. Basil, but it seems that they were not borrowed by the liturgy of St. Gregory from the Byzantine rite, instead these prayers are two of only three in these liturgies that are addressed to Christ, whereas the entirety of the liturgy of St. Gregory is written in this style, making it much more likely that the Byzantine liturgies borrowed from the liturgy of St. Gregory. Even the third prayer in the Byzantine liturgies addressed to Christ, the prayer before the Gospel, may have come from the liturgy of St. Gregory. This textual interaction shows that the Greek liturgy of St. Gregory was well known in the Byzantine rite, and rather early on. Dating this liturgy is also problematic, and relies on the full effect of the address of this liturgy to Christ. While some liturgical families, such as the East Syrian rite, for example, do have prayers addressed to Christ, especially in the anaphora, this is the only liturgy which is addressed to Christ in its entirety. Another element which sets this liturgy apart is its use of the term ὁμοούσιος, the liturgy of St. Gregory seems to be the only Greek language liturgy that uses this term independently in the prayers of the priest. Such a loaded theological term, along with a consistent focus on the divinity of Christ, places this liturgy into the context of the Arian and Pneumatomachian controversies of the late fourth century. The liturgy of St. Gregory the Theologian seems, then, to have been written in the environs of Constantinople, or nearby in Cappadocia, in the mid to late fourth century, this is especially tantalizing since that is the time and place in which St. Gregory himself lived and worked. While there is not enough evidence to say that St. Gregory was involved in the writing of the text, the theology and style of the liturgy do suggest that someone who was in his circle, or at least someone very familiar with his writings, wrote this text. The term ὁμοούσιος is not found in Scripture, which made using it in the Creed a rather contentious subject at the Council. The adoption of the term ὁμοούσιος “of one essence” is an example of the interaction of early Christianity with the world of Hellenistic philosophy into which it arose. Christianity had come into a world whirling with religious and philosophical movements. Stoics, Cynics, Epicureans, Neoplatonists, Hermetics the traditional state religions of Rome and the Greek city states, Judaism, Zoroastrianism, Egyptian religion in the form of the Isis cult, the Orphic cult, and other nascent religions like the cult of Mithras. From early on, Christianity had used the language of Greek philosophy, especially Neoplatonism, to express theological ideas, the Christian Neoplatonist Origen, for example, is perhaps the most famous example of this. In the fourth century, several notable theologians, known as the Cappadocian fathers, worked in the Neoplatonic tradition and helped to craft the theological framework of the eastern Christian church. St. Gregory the Theologian was one of these Cappadocian fathers, along with St. Basil the Great and St. Gregory of Nyssa. Already the programmatic use of the term ὁμοούσιος in the liturgy of St. Gregory shows that the Neoplatonism of Gregory himself is reflected in the text, and suggest that Neoplatonism may have other influences on the text as well. 7. Therefore we must ascend again towards the Good, the desired of every Soul. Anyone that has seen This, knows what I intend when I say that it is beautiful. Even the desire of it is to be desired as a Good. To attain it is for those that will take the upward path, who will set all their forces towards it, who will divest themselves of all that we have put on in our descent. In Ennead 1.6, Plotinus discusses the nature of beauty. Beauty is an aspect of the One, which Plotinus also terms “the Good.” The philosophical life, in Neoplatonism, as it is in Platonism, is a journey on the “upward way” in order to approach the One, and it is to this being that all are naturally drawn.. “Our journey is to the Good. “ This idea of ascent is integral in the understanding of the spiritual life in eastern Christian thought, in Gregory of Nyssa, the sould is: “drawn upwards toward Him as if by a rope.” This movement upwards occurs once the soul puts off “the varied impulses of its nature,” the “appetite for what is lacking.” This parallels Plotinus’ understanding of a three-part movement toward the good that only begins with the putting off of that which is unworthy: “First, is conversion from the lower life. Second, those who already gain a footprint in the upper sphere may advance still further, until they reach the topmost peak of the Noetic (pure Intellectual) realm.” It is once the soul has turned and put off these impulses “that we have put on in our descent” that the soul can move upward toward its goal, which is the Good. If the soul has not put off these impulses, it can be led astray because it is unable to recognize the Good: “if the soul is deceived of the good, because hope has tricked it with some imitation of beauty, the memory which follows the experience turns into shame.” The perversion of the soul’s natural movement toward the good persists in the Orthodox understanding of sin, which is as ἁμάρτια “missing the mark” more than a breaking of a rule. The movement toward the good is reflected too in the understanding of salvation in eastern Christian thought, θέοσις, becoming like God by grace through an eternal upward journey towards God. Liturgy forms a microcosm of the spiritual life in Orthodox theology, one that is also marked by the Neoplatonic movement upward. Where the goal of journey of the spiritual life is God, the goal of the journey of the liturgy is participation in the Eucharist. This understanding of liturgy makes in unnecessary to pick any one particular place or phrase as the point at which the particles of bread and wine transform into the Body and Blood of Christ. Instead it is the participation in the liturgy as a whole, as a journey, that brings the congregation as a whole and each as an individual upward: “as if by a rope” and allows for participation in the heavenly liturgy. 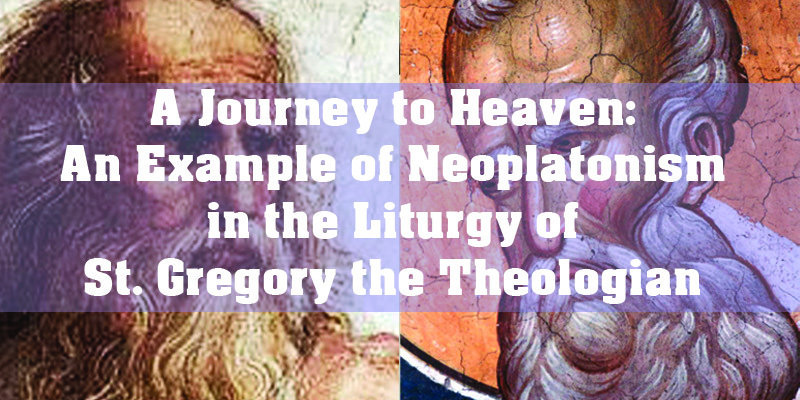 Already the first prayer of the liturgy reflects this Neoplatonic idea of movement, This prayer seem to be original to the text, and so provides a possible glimpse into how the author adapts this idea of movement to a liturgical setting. The prayer begins by identifying the goal of the liturgy: Ὁ ἐπισκεψάμενος ἡμᾶς ἐν ἐλέει καὶ οἰκτιρμοῖς, Δέσποτα Κύριε Ἰησοῦ Χριστέ, καὶ χαρισάμενος ἡμῖν παῤῥησίαν, τοῖς ταπεινοῖς καὶ ἁμαρτωλοῖς καὶ ἀναξίοις δούλοις σου παραστῆναι τῳ ἁγίῳ σου θυσιαστηρίῳ, καὶ προσφέρειν σοι τὴν φοβερὰν καὶ ἀναίμακτον Θυσίαν… The goal is the offering of the gifts, the Eucharist. There is some ambiguity, however, the author does not specify from where Christ is looking from. This allows a blurring in the narrative levels of the prayer. Where there are three levels: 1. the priest; 2. the altar where the sacrifice takes place and 3. Christ, the ambiguity blurs the level of the altar and Christ into one. These levels are further blurred when the priest says: Ἵνα ἀκατακρίτως προσελθὼν κατενώπιον τῆς δόξης σου, καταξιωθῶ τῆς σκέπης σου καὶ τῆς ἐλλάμψεως τοῦ παναγίου σου Πνεύματος… When does the priest come “into the presence of Your glory…,” but when he stands “around Your Holy Altar” to offer the Eucharist? The blurring of the narrative allows the author to turn the physical movement of the priest into the altar to celebrate the Eucharist into a microcosm of the movement towards Christ in the spiritual life. By paralleling the movement of the priest into the altar with the movement toward the Good, the author also reframes the requests for purification that occur in these prayers. These are not static, but form an integral, dynamic, part of the movement toward Christ. Καὶ μὴ ἀποῤῥίψῃς με ἀπὸ τοῦ προσώπου σου, μὴ βδελύξῃς με, τὴν ἐμὴν ἀνἀξιότητα, ἀλλ’ ἐλέησόν με ὁ Θεὸς κατὰ τὸ μέγα ἔλεος σου, καὶ κατὰ τὸ πλῆθος τῶν οἰκτιρμῶν σου ἐξάλειψον τὸ ἀνόμημά μου. Ἵνα ἀκατακρίτως προσελθὼν κατενώπιον τῆς δόξης σου, καταξιωθῶ τῆς σκέπης σου καὶ τῆς ἐλλάμψεως τοῦ παναγίου σου Πνεύματος, καὶ μὴ ὡς δοῦλος ἁμαρτίας ἀποδόκιμος γένωμαι, ἀλλ’ ὡς δοῦλος, ὅς εὕρω χάριν καὶ ἔλεος καὶ ἄφεσιν ἁμαρτιῶν, ἐν τῳ νῦν καὶ ἐν τῳ μέλλοντι αἰῶνι. The movement occurs, seemingly inevitably, the priest is drawn “as if by a rope” toward the altar and toward Christ. The outcome of this movement is in question, however, and the purification here allows for a movement not only upward toward Christ, but also from unworthiness to worthiness. The quotation from Psalm 50, also creates a sense of movement, from the participation in the Old Testament sacrifice, to the Eucharistic sacrifice of the New Testament. ὁ διὰ τῆς σωτηριώδους παρουσίας σου, καὶ τῆς ἐλλάμψεως τοῦ παναγίου σου Πνεύματος, καταξιώσας ἡμᾶς· τοὺς ταπεινοὺς καὶ ἁμαρτώλους καὶ ἀναξίους δούλους σου, παραστῆναι τῷ ἁγίῳ σου ϑυσιαστηρίῳ καὶ προσφέρειν καὶ λειτουργεῖν τοῖς ἀχράντοις Μυστηρίοις τῆς καινῆς σου διαθήκης. No longer does the priest ask for worthiness, for purification, but presents this as a matter of fact, as something accomplished. The references to the Old Testament in the first prayer are answered by the καινῆς σου διαθήκης, the New Testament in this prayer. The culmination of the movement: Αὐτὸς ζωοποιὲ, καὶ τῶν ἀγαθῶν χορηγὲ, ποίησον μεθ’ ἡμῶν σημεῖον εἰς ἀγαθόν…, through the entry into the altar the priest joins Christ, who is both the priest and the Eucharist. The movement, the Neoplatonic movement upward, created in the first two prayers of the liturgy foreshadows what comes in the rest of the liturgy, the movement toward and the participation in the Eucharist. The first two Prayers of the Liturgy of St. Gregory. Ὁ ἐπισκεψάμενος ἡμᾶς ἐν ἐλέει καὶ οἰκτιρμοῖς, Δέσποτα Κύριε Ἰησοῦ Χριστέ, καὶ χαρισάμενος ἡμῖν παῤῥησίαν, τοῖς ταπεινοῖς καὶ ἁμαρτωλοῖς καὶ ἀναξίοις δούλοις σου παραστῆναι τῳ ἁγίῳ σου θυσιαστηρίῳ, καὶ προσφέρειν σοι τὴν φοβερὰν καὶ ἀναίμακτον Θυσίαν, ὑπὲρ τῶν ἡμετέρων ἁμαρτημάτων, καὶ τῶν τοῦ λαοῦ σου ἀγνοημάτων, ἄνεσιν καὶ ἀνάπαυσιν τῶν προκοιμηθέντων πατέρων ἡμῶν καὶ ἀδελφῶν, καὶ στηριγμὸν παντὸς τοῦ λαοῦ σου. Ἐπίβλεψον ἐπ’ ἐμὲ τὸν ἀχρεῖον δοῦλόν σου καὶ ἐξάλειψόν μου τὰ παραπτώματα, διὰ τὴν σὴν εὐσπλαγχνίαν. Kαὶ καθάρισόν μου τὰ χείλη καὶ τὴν καρδίαν ἀπὸ παντὸς μολυσμοῦ σαρκός τε καὶ πνεύματος. Καὶ ἀπόστησον ἀπ’ ἐμοῦ πάντα λογισμὸν αἰσχρόν τε καὶ ασύνετον. Καὶ ἱκάνωσόν με τῃ δυνάμει τοῦ ἁγίου σου Πνεύματος εἰς τὴν Λειτουργίαν ταύτην καὶ πρόσδεξαί με διὰ τὴν σὴν ἀγαθότητα, προσεγγίζοντα τῳ ἁγίῳ σου Θυσιαστηρίῳ. Καὶ εὐδόκησον Κύριε δεκτὰ γενέσθαι τὰ μέλλοντα προσαγόμενά σοι Δῶρα, διὰ τῶν ἡμετέρων χειρῶν, συγκαταβαίνων ταῖς ἐμαῖς ἀσθενείαις. Καὶ μὴ ἀποῤῥίψῃς με ἀπὸ τοῦ προσώπου σου, μὴ βδελύξῃς με, τὴν ἐμὴν ἀνἀξιότητα, ἀλλ’ ἐλέησόν με ὁ Θεὸς κατὰ τὸ μέγα ἔλεος σου, καὶ κατὰ τὸ πλῆθος τῶν οἰκτιρμῶν σου ἐξάλειψον τὸ ἀνόμημά μου. Ἵνα ἀκατακρίτως προσελθὼν κατενώπιον τῆς δόξης σου, καταξιωθῶ τῆς σκέπης σου καὶ τῆς ἐλλάμψεως τοῦ παναγίου σου Πνεύματος, καὶ μὴ ὡς δοῦλος ἁμαρτίας ἀποδόκιμος γένωμαι, ἀλλ’ ὡς δοῦλος, ὅς εὕρω χάριν καὶ ἔλεος καὶ ἄφεσιν ἁμαρτιῶν, ἐν τῳ νῦν καὶ ἐν τῳ μέλλοντι αἰῶνι. Ναὶ Δέσποτα Παντόκρατορ, Παντοδύναμε Κύριε, ἐπάκουσον τῆς δεήσεώς μου. Σὺ γὰρ εἶ ὁ τὰ πάντα ἐνεργῶν ἐν πᾶσι, καὶ τὴν παρὰ σου πάντες ἐπιζητοῦμεν ἐπὶ πᾶσι βοήθειάν τε καὶ ἀντίληψιν. Ὅτι φιλάνθρωπος εἶ, καὶ δεδοξασμένος ὑπάρχεις Ἰησοῦ ὁ Θεὸς ἡμῶν, σὺν τῷ ἀνάρχῳ σου Πατρί, καὶ τῷ Ἁγίῳ σου Πνεύματι, νῦν καὶ ἀεί, καὶ. Master, Lord Jesus Christ, You who look upon us in mercy and compassion, who grant us, Your humble, sinful and unworthy servants the freedom to stand around Your Holy Altar, and to bring before You this fearful and bloodless sacrifice on behalf of our own sins and of the ignorances of Your people. For the remission and repose of our fathers and brothers, fallen asleep before us, and for the support of all Your people. Look upon me, Your useless servant, and wash away my errors by Your compassion. Purify my lips and my heart from all defilement of flesh and spirit. Keep away from me every thought that is shameful and witless. Make me sufficient, by the power of Your Holy Spirit, for this Liturgy and accept me, through Your goodness, approaching Your Holy Altar. Be well pleased, Lord, that these gifts, about to be brought before You by our hands, become acceptable, coming down and helping my weaknesses. Do not cast me away from Your face, nor loathe me because of my unworthiness, but have mercy on me, O God, according to Your great mercy and, according to the depths of Your compassions, wash away my transgressions. So that I, coming into the presence of Your glory, may be deemed worthy of Your protection and the illumination of Your All Holy Spirit; and not become worthless, as a servant of sin, but, as Your servant, may I find grace and mercy and forgiveness of sins, in this present time and in the coming age. Yes Master , all-mighty, all-powerful Lord, hear my prayer. For You are the One who accomplishes all things in all things; and we all seek aid and assistance from You in all things. For You are the lover of mankind, and You are praised, Jesus our God, with Your Father, who is without beginning, and Your Holy Spirit, now and ever. 2. Εὐχὴ μετὰ τὴν ἑτοιμασίαν τοῦ Ἁγίου Θυσιαστηρίου. 2. The Prayer after the Preparation of the Holy Altar. Δέσποτα Κύριε Ἰησοῦ Χριστὲ ὁ Θεὸς ἡμῶν· ὁ διὰ τῆς σωτηριώδους παρουσίας σου, καὶ τῆς ἐλλάμψεως τοῦ παναγίου σου Πνεύματος, καταξιώσας ἡμᾶς· τοὺς ταπεινοὺς καὶ ἁμαρτώλους καὶ ἀναξίους δούλους σου, παραστῆναι τῷ ἁγίῳ σου ϑυσιαστηρίῳ καὶ προσφέρειν καὶ λειτουργεῖν τοῖς ἀχράντοις Μυστηρίοις τῆς καινῆς σου διαθήκης. Αὐτὸς ζωοποιὲ, καὶ τῶν ἀγαθῶν χορηγὲ, ποίησον μεθ’ ἡμῶν σημεῖον εἰς ἀγαθόν, καὶ ἀξίωσον ἡμᾶς ἐν καθαρῷ συνειδότι λατρεῦσαί σοι πάσας τὰς ἡμέρας τῆς ζωῆς ἡμῶν, καὶ ἐν ἁγιασμῷ ταύτην τὴν θείαν προσενέγκειν σοι λειτουργίαν, εἰς ἄφεσιν ἁμαρτιῶν καὶ εἰς ἀπόλαυσιν τῆς μελλούσης μακαριότητος. Μνήσθητι Ἀγαθὲ Εὐέργετα Βασιλεῦ τῶν αἰώνων, καὶ τῆς κτίσεως ἁπάσης Δημιουργὲ, τῶν προσενεγκάντων καὶ δι’ ὧν προσήγαγον. Καὶ ἡμᾶς ἀκατακρίτους διαφύλαξον ἐν τῇ ἱερουργίᾳ τῶν θείων σου μυστηρίων. Ὅτι ἠυλόγηται, καὶ ἡγίασται, καὶ δεδόξασται, τὸ πάντιμον καὶ μεγαλοπρεπὲς ἅγιον ὄνομά σου, μετὰ τοῦ Πατρὸς, καὶ τοῦ ἁγίου Πνεύματος. Νῦν, καὶ. Master, Lord Jesus Christ our God, who, through Your saving presence and through the illumination of Your All Holy Spirit, deemed us, Your humble, sinful and unworthy servants, worthy to stand about Your Holy Altar, and to offer and perform the immaculate mysteries of Your New Covenant. Make Yourself, Life giver and giver of good things, a sign for good among us and deem us worthy, in pure understanding, to worship You all of the days of our life, and to offer unto You, in holiness, this Divine Liturgy, for the forgiveness of sins, and for the enjoyment of the coming blessedness. Remember, Good One, Benefactor, King of the Ages and the Origin of all Creation, the ones offering and the ones on whose behalf they offered; and keep us uncondemned in the carrying out of Your Divine Mysteries. For blessed and hallowed and glorified is Your all honorable and magnificent name, with the Father and the Holy Spirit, now, and. Beatrice, Pier Franco. The Word ‘Homoousios’ from Hellenism to Christianity. The American Society of Church History. 71:2. 2002. pp. 243-272. Bouyer, Louis. Eucharist: Theology and Spirituality of the Eucharistic Prayer. Univeristy of Notre Dame Press. 1989. Brakmann, H. Zur stellung des Parisinus Graecus 325 in der alexandrinisch-ägyptischen Liturgie. Studi sull’ Oriente Cristiano 3 1999. pp. 97-110. Budde, Achim. Die ägyptische Basilios-Anaphora. Text – Kommentar- Geschichte. Aschendorff Verlag. 2004. Caro, J.M.S. Eucharistia e Historia de la Salvacion. Biblioteca de Autores Cristianos. 1984. Cuming, Geoffrey, J. The Liturgy of St. Mark: edited from the manuscripts with a commentary. in Orientalia Christiana Analecta 234. Pontificium Institutum Studiorum Orientalium. 1990. Gerhards, Albert. Die Griechsische Gregoriosanaphora: Ein Beitrag zur Geschichte des Eucharistischen Hochgebets. 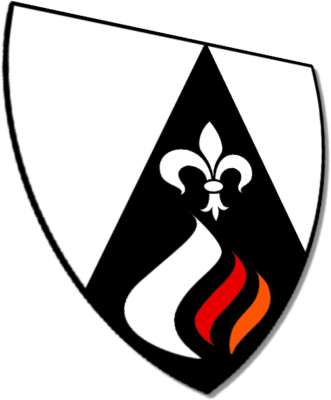 Aschendorff. 1984. Gregory of Nyssa. On the Soul and the Resurrection. (Roth, C. trans.). St. Vladimir’s Seminary Press. 2002. Hammerschmidt, Ernst. Die Koptische Gregoriosanaphora: Syrische und Griechische Einflüsse auf eine Ägyptische Liturgie. Akademie Verlag Berlin. 1957. Hanson, R.P.C. The Search for the Christian Doctrine of God: The Arian Controversy, 318-381; Baker Academic. 2005. Macomber, W. F. S. J. The Greek Text of the Coptic Mass and of the Anaphoras of Basil and Gregory According to the Kacmarcik Codex. Orientalia Christiana Periodica. 1977. pp 308-334. Maslov, B. The Limits of Platonism: Gregory of Nazianzus and the Invention of theōsis. Greek Roman and Byzantine Studies 52 2012. pp. 440-468. Newman, N. The Liturgy of St. Gregory the Theologian: Critical Text with Translation and Commentary. St. Dominic’s Media Press (forthcoming 2019). Plotinus. The Complete Works. (MacKenna, S. trans). Delphi Classics. 2015. White, Hugh G. Evelyn. The Monasteries of the Wadi ‚N Naturn: Part I New Coptic Texts from the Monastery of Saint Macarius. Arno Press. 1926 (reprinted 1973). This is because this liturgy is uniquely addressed to Christ in its entirety, instead of to God the Father. Cf. for example Hammerschmidt (1957) and Gerhards (1984) which discuss the Coptic and Greek versions of the Liturgy of St. Gregory; Cuming (1990) for the Greek version of the Liturgy of St. Mark and Budde (2004) for the Greek version of the Liturgy of St. Basil. The question of origin is one that has been dealt with differently by various scholars who have worked on it, presented here is only a small discussion. For more on this discussion see Hammerschmidt (1957) and Gerhards (1984). A number of Coptic and Syriac language liturgies use the term as an epithet of the Holy Spirit, usually in the ekphonesis of a prayer. Some of the Greek liturgies, such as the liturgy of St. James, adopt this as well. The second part of the Nicene Creed was composed by the second Ecumenical Council at Constantinople in response to the resurgence of Arianism in the form of Pneumatomachianism (also known as Macedonianism) later in the fourth century. The specific origin of the term is difficult to pin down. The term was in use in Neoplatonism as well as in Hermetic philosophy. Cf. Beatrice (2002), 243-272. For which these three: St. Basil the Great, St. Gregory of Nyssa and St. Gregory the Theologian are commemorated today in both the Roman Catholic and Eastern Orthodox Churches as saints. Whether or not Gregory is the actual author of the text. Plotinus Ennead 1.7. (translated by Stephen MacKenna). The Platonic ascent. Not that a Neoplatonist philosopher would have understood any difference between Platonism and Neoplatonism. Gregory of Nyssa The Purification of the Soul 77. Even the three steps of ascent toward the good discussed by Plotinus in Ennead 1.3. Like the history of the term ὁμοούσιος, that of the concept of θέοσις is a complex one. In his 2012 article, Maslov discusses the development of this idea from its origins in Stoicism into Neoplatonism and from there into Christianity..
 Bouyer (1989), 7. Alexander Schmemman also frames his discussion of Eucharistic theology in terms of movement. The first prayer in the Liturgy of St. Gregory is nearly identical with a prayer found in the Greek Liturgy of St. James. While the prayer seems to have its origin in the Liturgy of St. James, the fact that it is rewritten to reflect the Christ centered approach of the rest of the liturgy, and the close couplet formed by the first and second prayers suggest that it was adapted by the original author. Newman (forthcoming), 139-142. “Master, Lord Jesus Christ, You who look upon us in mercy and compassion, who grant us, Your humble, sinful and unworthy servants the freedom to stand around Your Holy Altar, and to bring before You this fearful and bloodless sacrifice…” Newman (forthcoming). “So that I, coming into the presence of Your glory, may be deemed worthy of Your protection and the illumination of Your All Holy Spirit…” Newman (forthcoming). “Do not cast me away from Your face, nor loathe me because of my unworthiness, but have mercy on me, O God, according to Your great mercy and, according to the depths of Your compassions, wash away my transgressions. So that I, coming into the presence of Your glory, may be deemed worthy of Your protection and the illumination of Your All Holy Spirit; and not become worthless, as a servant of sin, but, as Your servant, may I find grace and mercy and forgiveness of sins, in this present time and in the coming age.” Newman (forthcoming). “…who, through Your saving presence and through the illumination of Your All Holy Spirit, deemed us, Your humble, sinful and unworthy servants, worthy to stand about Your Holy Altar, and to offer and perform the immaculate mysteries of Your New Covenant.” Newman (forthcoming). “Make Yourself, Life giver and giver of good things, a sign for good among us…” Newman (forthcoming). After completing his undergraduate work in Ancient Greek and Classics at the University of New Hampshire, Nicholas Newman did his graduate work in Ancient Greek, Latin and Medieval History at the University of Zurich, Switzerland, completing his dissertation in 2014. Since finishing his doctoral work, he has been teaching Latin, Greek and Humanities at Kearsarge Regional High School and Northeast Catholic College in New Hampshire.